The city of Playa del Carmen is located on the coast of the Caribbean Sea close to Cancun. 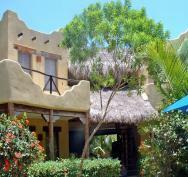 The city of Playa del Carmen is a destination that seems to offer a wide array of choices for its visitors. On one hand there is the beautiful beach and on the other the wonderful parks to visit; shopping is also on offer in the city as is fine dining in the numerous restaurants. School info: Mid-sized school with 15 spacious classrooms, tropical gardens, cafeteria, well stocked library, free internet access, located in Playa del Carmen. School info: Typical Mexican style building, open and airy study rooms, computer facilities, kitchen, common area for mingling, garden area and swimming pool. The Eco-archaeological Park that is situated approximately 4 miles to the south of Playa del Carmen is called Xcaret. The park celebrates the Maya people who are a diverse range of Native American people. At Xcaret visitors can take Maya excursions and experience the true sense of the Mayan culture, in the Mayan village you are invited to take a peek into the daily lives of the Mayan people. There are stunning replicas of their houses which they made with wood and palm leaves; the roof was always constructed from palm leaves that would have been cut the previous night by the light of a full moon. The Maya believed that the actual juice from the palm would reach the leaf tips therefore making them waterproof for the following 25 years. The park also boasts archaeological sites that visitors can view on one of the Maya excursions taking place on a daily basis. One of the main features throughout Xcaret is the wonderful collection of tropical birds and wildlife from the delicate butterflies and cave dwelling bats to the mighty jaguar and the graceful deer. The street to visit in the city of Playa del Carmen is Quinta Avenida which is also known as English 5th Avenue. This street is the main destination for the city's visitors as there are numerous shops, restaurants and bars located either on the street itself or leading off from it. Playa Tukan is the best beach which is situated at the north end of the city. For nightlife in Playa del Carmen the best clubs are on the actual beach, the Blue Parrot and El Pirata are the two clubs that always seem to be rated as the best ones.